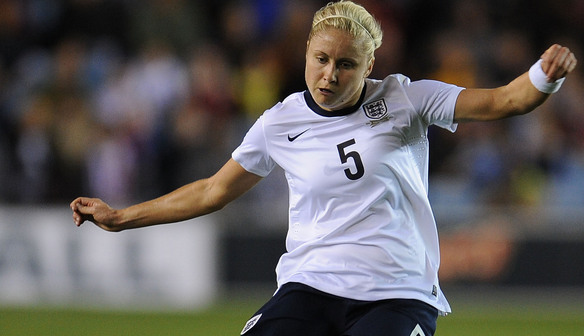 England’s Steph Houghton will join City’s women’s team as the Blues recruit yet another experienced international to their ranks. Houghton will join the club on a three-year deal on New Year’s Day, following international teammates Jill Scott, Karen Bardsley and Toni Duggan in the move to Manchester. With an already-impressive history, glittering with trophies and medals, Houghton is hoping to add many more achievements to her CV in the coming years. “I’m very excited,” she said. “I’m so glad that City came in for me because as soon as I heard their plans for the future, I knew I wanted to be part of it. “Women’s football is on the up and it’s becoming more competitive. There are a lot of transfers going on at the moment because every club has a vision to compete at the highest level. Houghton began her career at local club Sunderland Ladies, before moving to Leeds United Ladies in 2007. During her time at the Whites, she was named the 2008 FA Women’s Young Player of the Year and played a key role in their 2010 FA Women’s Cup win, attracting interest from Arsenal. After signing for the Gunners, Houghton picked up plenty of silverware. In her debut season, she was a pivotal part of their ‘treble-winning’ side that lifted the inaugural Women’s Super League title, the FA Women’s Cup and the Continental Cup. Houghton admitted that it was tough to leave Arsenal but she is confident that she made the right decision and is looking forward to playing for City. “I’d like to thank Arsenal very much for everything they’ve done for me,” she said. “They’ve helped me to grow as a player and it was a massive decision for me to leave. I had three very successful years there and I didn’t take the decision lightly. “I’m looking forward to a new challenge now though and I’m eager to meet the City squad and the coaches. Houghton first represented her country at under-16 schools level and has gone on to make 40 appearances for the Three Lions. She made her senior debut in 2007 and since then, has gone on to score six goals, participating in her first major tournament at the 2011 Women’s World Cup. She became a household name a year later, whilst representing Team GB during the Olympic Games. Despite playing as a left-back, she found the net in all three group matches, scoring the winning goals against New Zealand and Brazil. Unsurprisingly, she was named ‘left-back of the tournament’. Needless to say, Houghton is proud of her achievements but is looking to gain many more at her new club. “Taking part in the Olympics and to be part of Team GB was very special,” she said. “That’s probably my career highlight. Of course, I won the FA Cup with Leeds and Arsenal too and to lift the trophy as captain was pretty amazing!